Supervising anesthesiologists overseeing several operating rooms must be aware of the status of multiple patients, so they can consult with the anesthetist in single operating rooms or respond quickly to critical events. However, maintaining good situation awareness can be challenging when away from patient bedsides or a central monitoring station. In this proof-of-concept study, we evaluated the potential of a head-worn display that showed multiple patients’ vital signs and alarms to improve supervising anesthesiologists’ situation awareness. Eight supervising anesthesiologists each monitored the vital signs of patients in six operating rooms for 3 h with the head-worn display, and for another 3 h without the head-worn display. In interviews with each anesthesiologist, we assessed in which situations the head-worn display was used and whether the continuous availability of the vital signs improved situation awareness. We also measured situation awareness quantitatively from six of the eight anesthesiologists, by instructing them to press a button whenever they noticed a patient alarm. The median number of patient alarms occurring was similar when the anesthesiologists monitored with the head-worn display (42.0) and without the head-worn display (40.5). However, the anesthesiologists noticed significantly more patient alarms with the head-worn display (66.7%) than without (7.1%), P = 0.028, and they reported improved situation awareness with the head-worn display. The head-worn display helped the anesthesiologists to perceive and comprehend patients’ current status and to anticipate future developments. A negative effect of the head-worn display was its tendency to distract during demanding procedures. Head-worn displays can improve supervising anesthesiologists’ situation awareness in multiple-patient monitoring situations. The anesthesiologists who participated in the study expressed enthusiasm about monitoring patients with a head-worn display and wished to use and evaluate it further. The online version of this article ( https://doi.org/10.1007/s10877-019-00265-4) contains supplementary material, which is available to authorized users. The authors thank Dr. Michael Neumann, Dr. Frank Kobelt, and the other members of the SMI team of the University Hospital of Würzburg who helped to integrate the HWD into the hospital’s IT systems for their great support. The authors declare that they have not received any funding for their research. All procedures performed in studies involving human participants were in accordance with the ethical standards of the institutional and/or national research committee and with the 1964 Helsinki declaration and its later amendments or comparable ethical standards. The hospital’s ethics committee was informed about the study and on 13 December 2017 we received a waiver that no ethics clearance was required. was obtained from all individual participants included in the study. Schlosser P, Grundgeiger T, Happel O. 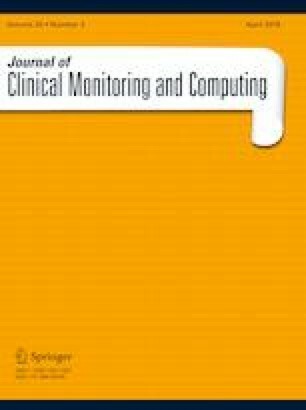 (2018) Multiple patient monitoring in the operating room using a head-mounted display. Proceedings of the CHI Conference extended abstracts on human factors in computing systems. p. 1–6. https://doi.org/10.1145/3170427.3188460.